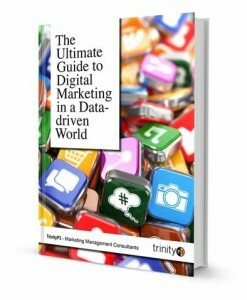 Welcome to the 4th Chapter of “The Ultimate Guide to Digital Marketing in a Data-driven World”. If you missed Chapter 3 you can read it here. This is one of a series of 11 posts or if you want to get the entire book in one hit you can download the full book here. In this Chapter we look at the development of your actual digital marketing strategy and how to best focus your energy on the right aspects of your strategy. 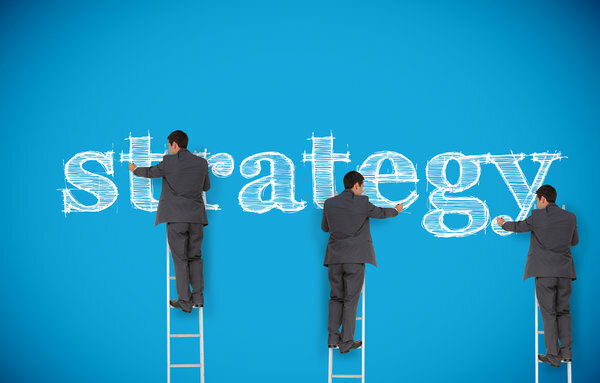 Now that you have set your mission, vision, goals and objectives, along with the framework for collaboration, it’s time to flesh out the actual digital marketing strategy that will help you reach your objectives, allocate resources and budgets, and define the critical metrics for measuring success. 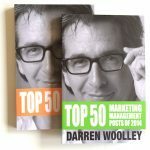 The development of your go-to-market strategy, which is the focus of this chapter, should be done in conjunction with listening to your customers, identifying their needs and creating a more relevant customer-segmentation strategy – these issues are dealt with in Chapter 5. However, life in the new digital world, as we’ve already mentioned, is highly interactive rather than one-way and sequential. Digital technology allows consumer actions and decision-making to be more iterative and integrated. 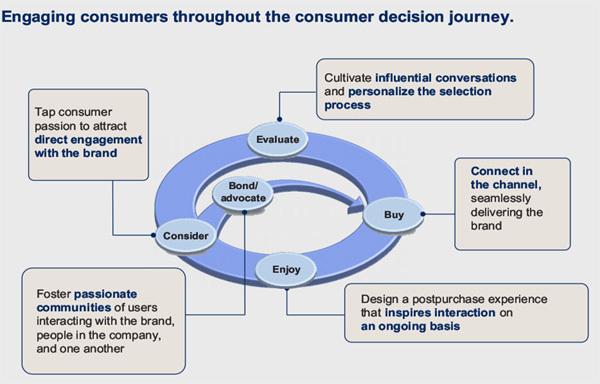 So many leading digital organisations now cite the McKinsey loyalty loop (shown below) as the preferred consumer decision journey (CDJ). The CDJ approach opens up a much richer range of strategies and allows you to focus your energy on the right aspects. It changes your thinking from a conversion mentality to a belief in satisfying needs and behaviours. Using the following hypothetical example, let’s now bring these stages to life. An organisation sells flowers online – we’ll call it flowers2friends. This service allows you to order flowers online and then have them physically delivered by a network of local florists. The florist who is nearest the intended recipient of the flowers will fulfil your order, and they guarantee delivery within three hours of the order being placed or you get your money back. Let’s develop strategies for each stage of the CDJ on the assumption that the key target market for this business is men aged 30–50. First, as flowers2friends is an online-transaction-only organisation, it naturally requires a website with e-commerce functionality. The website content and structure will also need to be optimised to achieve a strong organic ranking in search engines. Google is constantly changing its algorithm, so it is important to seek advice from an SEO expert to determine how to maximise the ranking of the business in the context of a competitive flower industry. One such change, which Google recently introduced via its Hummingbird update, concerns the impact of intra-website social and conversations on the actual website ranking. This means that flowers2friends will need to consider the level of engagement from customers on its website. This may include ratings of the service, testimonials from happy recipients, reviews, and perhaps the ability to +1 or like, or to share content, offers or specials. Also, initially, the business will need to spend some money on SEA in order to be visible on the first page of a search engine. Now that flowers2friends has planned its website presence, it will need to consider the impact of wider social media. This can be viewed as owned, earned or paid media. Owned media is an organisation’s assets; for example, a blog or a Facebook page that is managed by, or on behalf of, the organisation. For this example, we will create a flowers2friends Facebook page and a calendar of content activity (status updates) based on seasonal themes and which includes key events that may appeal to men. We will also assign resources for monitoring and managing the Facebook page interaction and response, as we foresee a variety of service-based inquiries coming through the page. And we will develop a crisis strategy, escalation policy and contingency plan, to be prepared in case of any serious consumer backlash. However, we hope to never need these as we aim to be transparent and honest in all our communications. 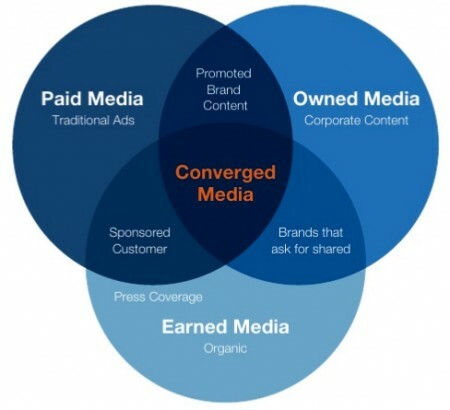 Earned media involves creating a strategy for customers to share your content within their social networks, as discussed earlier. And paid social media refers to paying for advertising placements within social networks. Facebook allows you to easily set up ads and sponsored stories which you can aim at your preferred target market simply by choosing demographic variables, locations and areas of interest that the target market may have. For this example, we will develop a series of creative ads and messages to test and target men aged 30–50 within one country. Now that its social media is planned, flowers2friends will want to create a database of prospects who are interested in the service. To do this, it will produce an e-newsletter that people can opt into from the website. The email program will need to be fleshed out in order to not only welcome people to flowers2friends, but also to demystify the service and brand world, as well as start to build relationships through stages 2, 3, 4 and 5. This can be mapped out as a content and activity calendar, with automated triggers being sent out according to behaviour, tenure and value. Having planned its digital channels, flowers2friends can now look at broader media and strategies to get itself into the consideration set. As CMO of the company, you decide to create a PR strategy and launch event. You bring the whole service to life by creating pilot videos of people receiving flowers, to demonstrate the emotions recipients feel when they get flowers. You also incorporate a series of press and radio ads for the first six months to specifically target men aged 30–50. Interestingly, you have built your consideration plan from the customer experience point of view rather than from a media-first point of view, the reverse of how traditional media is typically planned. Now that you have planned how to get flowers2friends on a person’s radar, you need to develop the evaluation plan. First, you must consider how to help prospects evaluate your offering given the number of competitors out there. You decide to focus on an emotional hook, as alluded to above – rather than talk about your service, you will bring to life the emotional response to receiving flowers. So you create a series of videos that are housed on your website, sent to prospects via your email program (so that people click from the email to the website to view the videos) and then added to your Facebook page for people to share. Consumers can now like and rate the videos as well as add comments. In time, you want to build up a bank of videos which are all rated, sparking commentary and prompting the videos to be shared, which will help attract more business. However, for this strategy, you want to encourage women (as the recipients of flowers) to influence men, so you also create a Facebook advertising campaign around the videos that targets women, to spark more sharing. Now that you have a strategy to get men interested in buying flowers from you (and also to have them influenced by women to make purchases), you need to entice them to buy the right ones. Again, you opt for an emotional strategy to heighten the otherwise functional purchase of flowers. Rather than the typical listing of flowers and other products, you create a series of ‘mood products’ – various types of flowers that reflect different moods the customer might be in, or moods they would like to create with the recipient. Next, you ensure that these products can be selected and paid for within four clicks. You also build a mobile app to make it even easier for people who are on the go to make purchases. The end result is a seamless, simple process that is a pleasant surprise for the target market. Now this is where your marketing strategy really connects. You don’t just want to assume that customers are satisfied – you want to ask them if they are. So you implement a series of three emails. The first is sent 24 hours post-purchase purely as a thank you for shopping. The second email is sent 72 hours after the sale and asks the customer for a rating, and to share this on Facebook. The third email is sent a week post-purchase as a fun feedback survey that includes a net promoter score (NPS) question, which you will use to target customers who had issues versus those who were extremely satisfied and happy to recommend/advocate flowers2friends. As we mentioned earlier, you will also map out an ongoing email communication calendar and content targeting different segments of customers. In particular, you should arrange for an email to be sent out every four months to people who haven’t repurchased within that period. Some organisations believe that simply by creating a great experience, people will naturally advocate their business. While this is partly true, you should also identify your best, most satisfied customers and then, based on their proactive behaviour, enable them to become advocates of your business. These are the customers who deliver profit (not sales revenue) – they are willing to regularly buy your high-margin products rather than just talk about it. Data analysis and modelling will allow you to identify these top customers, who may make up the top 1–5% of flowers2friends’ customer base. Adding an NPS question will reveal an attitudinal dimension of your best customers who are willing to recommend others. This is the form of advocacy that you will want to create – having your most profitable customers bring new customers to your business. Finally, you will need to set your campaign metrics to benchmark and map back to your business objectives. The table below outlines some of the key metrics that flowers2friends could consider for each stage of the CDJ. As you can see, marketers have switched their focus from the traditional reach and frequency metrics, the old one-way measures, to a deeper set of two-way engagement measures. Engagement relies on relevance, therefore the more targeted and relevant your offering is, the more likely you are to convert prospects into customers. At the same time, by setting clear metrics for each stage of your strategy and the CDJ, you will be able to clearly benchmark success and not drown in data. Create your executive reports or dashboards around these key measures and leave additional measures and analysis to more detailed reports. In the next chapter we look at how to establish customer segmentation and explain the shift from simply identifying functional drivers to also understanding emotional drivers. You can read Chapter 5 here. There are no bells, no whistles, no hype.